Aird Scouts Up Helly Aa. By R. Koczy. Last minute preparations are underway for possibly the only Up Helly Aa on the Scottish mainland- if not the world. From Drumnadrochit to Kirkhill, Aird Scouts are putting finishing touches on their Viking helmets, swords and shields, while their leaders are hammering the last nails into the sacrificial long boat. 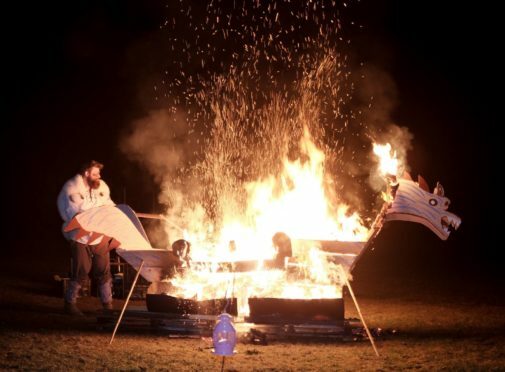 Some 70 Beavers, Cubs, Scouts and Explorer Scouts, including girls unlike Shetland’s event, will make their way to Kirkhill primary school on Tuesday, January 29, and parade their boat to the football pitch for the ceremonial burning. The 7th Inverness (Aird) Scouts started the tradition in 2012, when they were learning about Vikings at school. A tradition has grown since then, and the scouts have gone on to hold four more UP Helly Aas since then, with the event growing in popularity each time. Assistant scout leader Dave Knox said: “The boat is built by some of the cub and scout leaders from scrap wood, off-cuts and anything we have lying around. “It usually takes a day or so to build and decorate it. “The Beavers and Cubs prepare for the event by making helmets, swords and shields in the weeks before. These are usually made from cardboard or plywood and the young people will decorate them as they want. This year there will be a hog roast, and tea and coffee on sale. Proceeds from the tea and coffee will be donated to the Raising for Roz fund.